After browsing through my list of perfume reviews written over the last two years, it shocks me that not one scent from this unique line has been included. Therefore, I am proud to introduce Comme des Garçons, a Japanese fashion label founded in 1969 committed to excellence in fragrance. According to Wikipedia, Comme des Garçons released their first fragrance, named after the company, in 1994 and has since been committed to developing fine, unisex scents based upon non-traditional notes. For this month's Amber devotion, I picked the refreshing Series 4 Anbar. 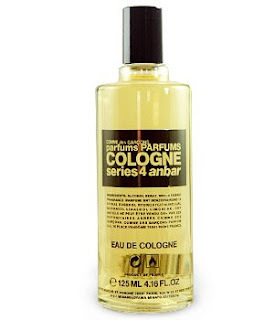 The Series 4: Cologne collection contains three scents, all in cologne form, designed to be splashed and applied liberally while remaining remarkably close to the skin. (Read: the wearer will not overwhelm others but rather draw others closer to take a whiff of light scent.) True to form, these scents play on the skin for a short while. What they are not is a day-to-night fragrance to be applied in the morning with bottom notes lasting until dusk. Therein lies their charm and uniqueness. I was quite surprised with Anbar at first sniff due to its abundance of citrus. The notes include mandarin, amber, carnation and musk. Had I been aware of its cologne status prior to testing, I would have been more prepared for a clean scent substituting a warm and dirty aroma. This amber lazily mopes in the background, while the mandarin and carnation dance together for most of the scent's development. Slightly sweet, mostly clean and quite manly smelling, Anbar provides a fantastic deviation from the artificial body sprays of the world and is light enough to be applied liberally before heading off to work. How I wish I could carry a bottle of this with me for every man who made me gag during early pregnancy. I would hand it off politely and say, "Try this instead of showering in whatever you are wearing on your skin." Yes, Series 4 Anbar would have been welcome to grace my nose any day when I was most sensitive. Even today, I find it invigorating and eye-opening. In conclusion, I am impressed with Comme des Garçons as a house and must try other offerings after discussing their scent philosophy. Although Series 4 Anbar is not for me, at its affordable price point I will be purchasing a bottle for my husband. I am still searching for a bombshell amber to call my own! More on that next week. The reason we perfumistas love Luckyscent so much is their ability to make obscure fragrances available in the United States. I am happy to say Comme des Garçons Series 4 Anbar is available at www.luckyscent.com. Although it is currently backordered, it will be available to ship October 20, 2008. A 125mL splash bottle retails for $52. Yes! No surprises – this is very citrusy. I have also used Series 4 Anbar. Great. Other one is quite natural smelling, and thus I enjoy it a lot. There are lovely green and light herbal notes, a hint of pine/mint from the rosemary and another grassy hint from vetiver. These give the scent very good longevity, and the citrus finds a way to linger too. I like this very much! Some series of scents are designed to layer, and I have no doubt this would add sparkle to many scents. I think it stands well on its own, as well. I am not sure where to buy them. I have only one store near me in philly called touchofperfume.com Touch of perfume Touch of perfume. Looking for some suggestion where I can get best perfume online.